These treats are roasted block-shaped peanut snacks coated in nori (dried seaweed), soy sauce, sesame, and curry flavoring. The coating is made with glutinous rice flour to give it crunchiness. Two kinds of seaweed go into the flavoring, dried toasted nori, and green laver, giving these snacks a subtle, unique taste of ocean, and the curry flavor adds the zest. 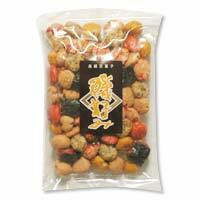 Japanese people enjoy these snacks with sake.